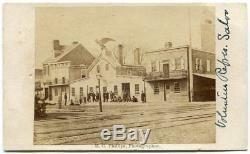 1861 - 1865 Civil War CDV photo of the Union Volunteer Refreshment Saloon in Philadelphia. The Saloon is at the center with the large eagle on top. A "Union Volunteer Hospital" is on the left. A large group of soldiers, men, boys, and a policeman are out front. 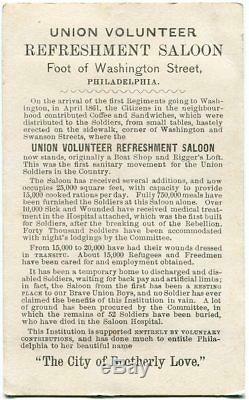 The reverse contains printed information about the Saloon, numbers of soldiers served, etc. (Henry Chapman) Phillips out of Philadelphia. SIZE: Measures approximately 2 3/8 x 4 inches. The item "Civil War Union Volunteer Refreshment Saloon & Hospital Philadelphia CDV Photo" is in sale since Tuesday, November 27, 2018. This item is in the category "Collectibles\Militaria\Civil War (1861-65)\Original Period Items\Photographs". The seller is "abvintagephotos" and is located in Pennsylvania. This item can be shipped worldwide.